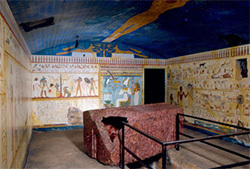 Explore our underground rock-cut tomb and learn more about the funerary beliefs of the ancient Egyptians. Modeled after several rock-cut tombs found at the Beni Hasan cemetery site in Middle Egypt, this tomb was constructed to show a style found during the Middle Kingdom (2066 – 1650 BCE). Beni Hasan was a popular burial site during the Middle Kingdom with Nomarchs – provincial administration officials. This area houses over thirty tombs, of which only a few are open to the public. This composite replica contains many images from the tomb of Khnumhotep II – a nomarch of the Twelfth Dynasty. Rock-cut tombs during the Middle Kingdom were cut into naturally occurring rock formations to create chambers. The entrance would have a lintel, above which contained an inscription that named the tomb’s owner, described the family’s affiliation(s), and praised the deity of the deceased. The entrance would also contain columns that would lead a visitor into an offering chamber. The offering chamber served as a place where the friends and family of the deceased gave donations. These donations would be everyday items needed in the afterlife, such as food and drink. Generally, items would be offered to the deceased by either a friend, a family member, or a Ka priest. The Ka – or soul – of the deceased would take the spirit of the offerings to the afterlife. During the Middle Kingdom, these offerings were placed in front of a false door, or spirit door. Many tombs would have a second chamber behind the false door or underneath the offering chamber, known as the burial chamber. This chamber housed the mummy of the deceased and was closed to the public after the funeral. At the center of the chamber would be a shaft, which would contain the sarcophagus. The surrounding walls of the burial chamber would have an array of images that would not only show the different aspects of the deceased’s daily life, but also the journey the person would take into the afterlife.